This article is about the microgame from WarioWare: Twisted!. For the Daredevil Comet, a Prankster Comet from Super Mario Galaxy, see here. Info Ready...GO! Time your dash, or you might get squished. Daredevil is one of Jimmy T.'s microgames in WarioWare: Twisted! The player controls a nondescript figure. The game's purpose is to run under the iron bar and cross to the other side without getting crushed. 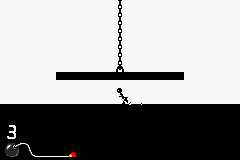 1st level difficulty: The iron bar is small. 2nd level difficulty: The iron bar is a bit larger. 3rd level difficulty: The iron bar covers most of the screen. This page was last edited on November 17, 2018, at 03:24.